Mhondoro elephants like a drink! 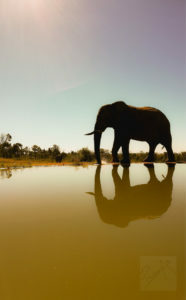 Mhondoro guests are often treated by sightings of herds of elephants visiting the lodge waterhole, providing excellent photographic opportunities close up at water level, from the game viewing hide that is connected to the lodge by a 65m long underground tunnel. 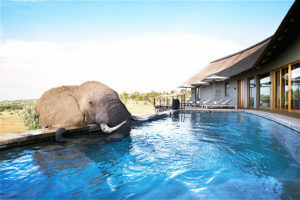 And sometimes, lucky guests may be surprised by elephants taking a drink from one of its natural saltwater swimming pools! Privately owned, Mhondoro Safari Lodge & Villa on Welgevonden Game Reserve stretches across 35 000 hectares in the Waterberg and is a mere 2h 45 minute drive or a 50 minute flight from Johannesburg. Guests can expect varied terrain and a diverse natural habitat featuring the ‘Big 5’, including a large white rhino population. Guided walks with the endangered white rhino are very popular with guests, as is watching the ‘resident’ herd of elephants who visit the lodge’s waterhole almost daily.